Whip up an easy slow cooker weeknight dish that is full of Burgundy flavor. Everyone in your family will think you slaved over this all day! 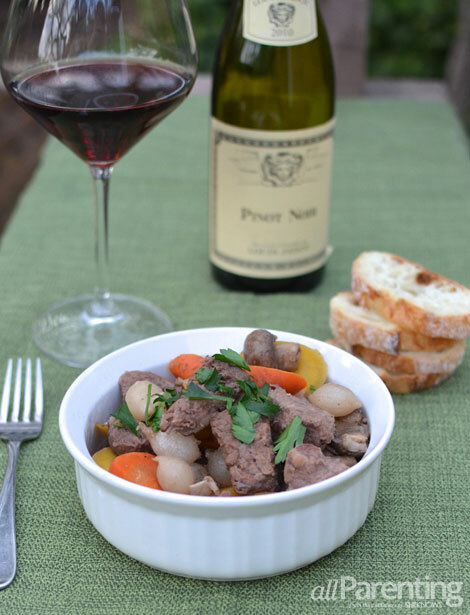 There is nothing better in the winter than a big bowl of beef stew and a glass of red wine to warm you up. Grab your slow cooker and prepare to wow your family with this rich and comforting beef Burgundy stew. Everyone will love this robust, flavorful twist on the French classic. Beef Burgundy (Bourguignon) is a French staple. From rustic peasant origins, this rich stew of beef braised in red wine has evolved to win a place at anyone’s table. Browning the bacon and beef before adding to your slow cooker will add smokiness to the dish that enhances the flavors. 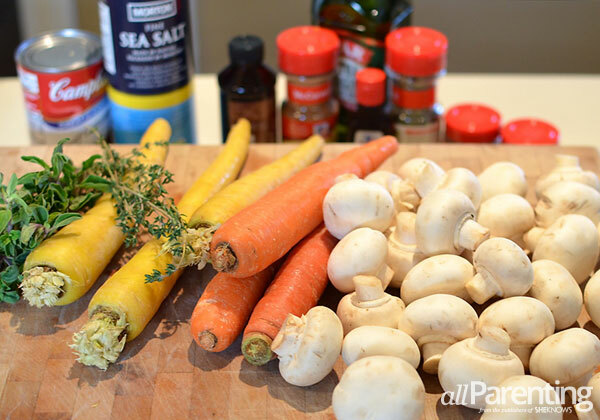 Carrots, mushrooms and pearl onions are the perfect vegetables to accompany the beef Burgundy and cook beautifully in the slow cooker. Don’t forget the wine! 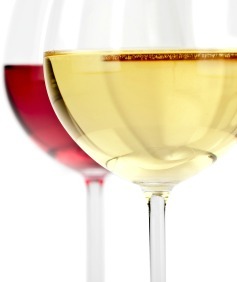 Any inexpensive Burgundy, which is French pinot noir, will work for cooking. Try the Louis Jadot Pinot Noir Bourgogne from BevMo! and don’t forget to pour yourself a glass while you are cooking! In a large skillet, cook bacon over medium heat until crisp. Use a slotted spoon to remove to a plate lined with a paper towel. Leave about 3 tablespoons of bacon fat in the pan to brown beef in. Combine beef in a large resalable plastic bag with 2 tablespoons of the flour, 1/4 teaspoon of the salt and the pepper. Shake to coat. Add butter to bacon skillet and melt. Add beef in batches and brown for 2 to 3 minutes, stirring to sear all sides. Spoon browned beef and bacon into slow cooker. Reduce heat under pan to medium and add 1/2 cup of the beef broth. Cook for 2 minutes, stirring up any brown bits on bottom of pan. Pour into slow cooker along with bacon, carrots, mushrooms, garlic, red wine, thyme, oregano, bay leaf and remaining beef broth. Scatter onions over top of vegetables. Cover and slow cook on LOW for 6 to 8 hours, or until meat is done and tender. With a slotted spoon, remove beef and vegetables to a large serving bowl. Remove bay leaf, thyme and oregano sprigs. Whisk together remaining 3 tablespoons of flour with 3 tablespoons of water in a small bowl. Strain hot liquid from slow cooker into a medium saucepan. Whisk in flour mixture and bring to a boil over medium-high heat. Boil 3 minutes, until thickened. Pour sauce over beef and vegetables in large serving bowl with remaining salt and pepper to taste. Spoon beef Burgundy over hot buttered noodles, mashed potatoes or alongside crusty bread. Garnish with fresh parsley, serve and enjoy! When thinking about the best wine to pair with beef Burgundy, Burgundy (pinot noir) immediately pops into anyone’s mind since you are using the wine in the dish. However, since it is a beef stew, cabernet sauvignon or merlot will also pair nicely. If you decide to pair with a pinot noir, a rustic French Burgundy will pair the best with this rich, robust dish.